Whether we are checking emails, following friends on Facebook and Twitter, catching up on gossip from TMZ, planning holidays on TripAdvisor, arranging dates on Match.com, watching videos on Youtube, or simply browsing for deals on Amazon, the internet pervades our professional and personal environments. The internet has revolutionized our lives, but at what cost? In The Internet Trap, Ashesh Mukherjee uses the latest research in consumer psychology to highlight five hidden costs of living online: too many temptations, too much information, too much customization, too many comparisons, and too little privacy. The book uses everyday examples to explain these costs including how surfing the internet anonymously can encourage bad behavior, using social media can make us envious and unhappy, and doing online research can devalue the product finally chosen. The book also provides actionable solutions to minimize these costs. For example, the book reveals how deciding not to choose is as important as deciding what to choose, setting up structural barriers to temptation can reduce overspending on e-commerce websites, and comparisons with others on social media websites needs to be cold rather than hot. 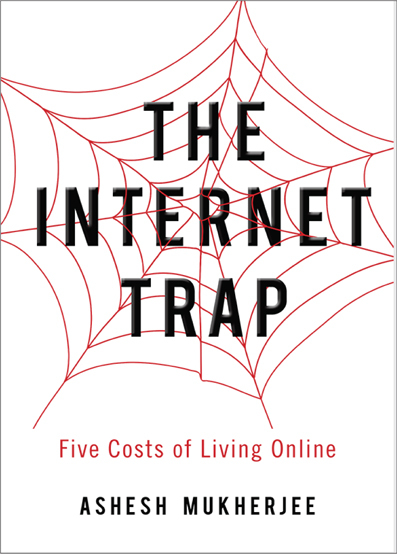 The Internet Trap provides a new perspective on the dark side of the internet, and gives readers the tools to become smarter users of the internet.